Posted on 06/11/2010, 19:12, by martin, under General, References, Soccer, Sports. Querying places, teams, groups and dates highlights all associated information in the other dimensions. Selecting the “marginal distributions” (at the arrows) shows calendars, match schedules and maps – neat! 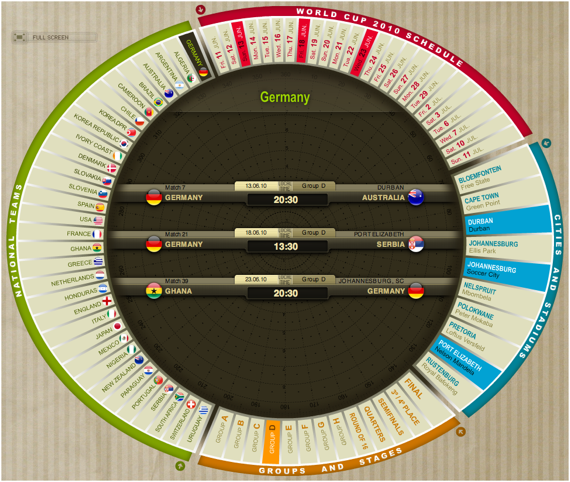 Infosthetics lists some more visualizations which even show live updated soccer statistics. Although I don’t believe much in this kind of statistics like – every game on a Sunday when Lionel Messi was wearing blue socks was won by Argentina with one goal by Messi – I guess it is fun to watch the live updating of the objective soccer statistics and comparing it to the subjective observation of the game and trying to find out how this matches up and probably might explain why a team wins or not. Visual Loop (http://visualoop.tumblr.com/), a non-stop stream of infographics and other forms of data-visualization.